Coming into the NHRDA World Finals, Wimmer decided he wanted to bring his truck from California as he felt more comfortable racing it. 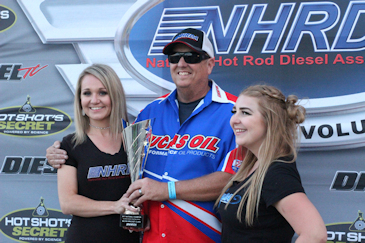 All Wimmer had to do was pass tech to clinch the 2017 NHRDA Hot Shot's Secret Diesel Drag Racing Series Big Rig Bracket National Championship. Wimmer wanted the NHRDA World Championship as well. Wes qualified #4 and defeated Mike Clifton in the first round which gave him a single in the semi-finals. Wes faced off with Rick Fenwick in the final round and unfortunately for Wimmer he was late off the starting line and Fenwick used that to take home the NHRDA World Championship and the ring.